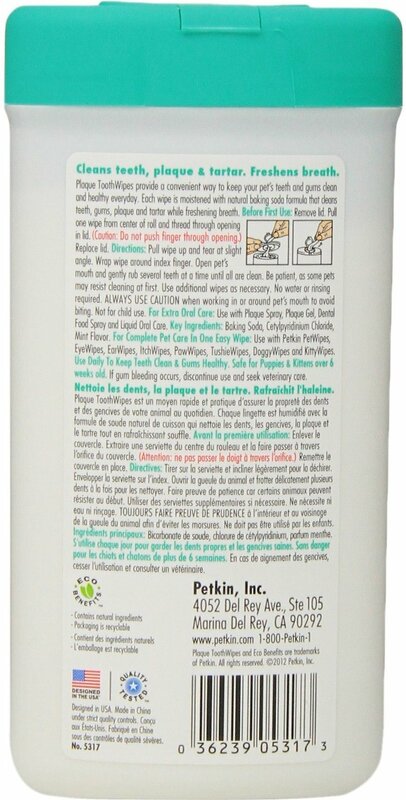 Petkin Fresh Mint Dog & Cat Plaque Tooth Wipes help you say goodbye to stinky breath. 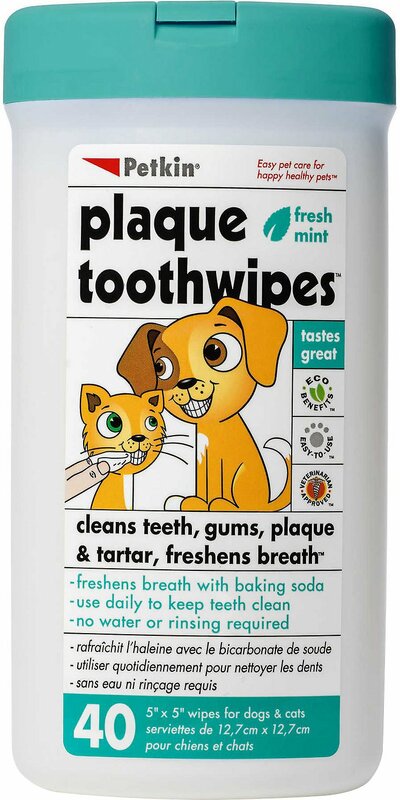 These wipes provide a convenient way to keep your furry friend’s teeth and gums healthy by wiping away daily residue. Each soft wipe is moistened with natural baking soda and mint flavor to gently clean while freshening his breath. To use, just open the lid, pull out a wipe and clean your pet’s mouth without water or rinsing—it’s just that easy! Made with baking soda and mint flavor for a gentle and freshening clean. Convenient wipes work to remove daily residue in your pet’s mouth, keeping their teeth and gums clean and healthy. Freshens breath with natural baking soda for more enjoyable kisses. Resealable snap-lid keeps unused wipes moist and ready for use. A fast and convenient way to keep your pet clean and feeling his best. Safe for dogs and cats over 6 weeks old. If gum bleeding occurs, discontinue use and seek veterinary care. Not for child use. Baking Soda, Cetylpyridinium Chloride, Mint Flavor. Pull wipe up and tear at slight angle. Wrap wipe around index ﬁnger. Open pet’s mouth and gently rub several teeth at a time until all are clean. (Be patient, as some pets may resist cleaning at ﬁrst). Use additional wipes as necessary. Always use caution when working in or around pet’s mouth to avoid biting. I love these wipes so much. My dachshund will NOT let me brush her teeth. I have tried everything. She is getting older and I know how important it is for her health to have healthy teeth. I bought these on a whim thinking they wouldn’t work, and I’m amazed that she actually lets me use them on her. They really do help with her breath too! My dogs don't HATE them.... but they are more just a month wet wipe. I thought they were a little sleeve that slipped over my finger, but not the case. They rip pretty easy and are not perforated for ease of pulling out if the container. I can't really tell if they are working to clean their teeth or not. I'm disappointed. My dog doesn't seem to mind my wiping her teeth daily with these. She has a history of dental problems; let's see if these help. I really don't want to have to put her under anesthesia again. These are way too large and honestly don’t seem to work at all. They are smooth whereas I think they should be textured to actually get plaque off my cat’s teeth, and don’t smell strong enough to actually improve my cat’s breath. Little dogs have a hard time with tooth brushes that can scratch the gums. These wipes work perfectly and they love the taste. These are a great alternative to the brush. The actual wipe doesn't smell great, but the enzymatic formula fixes up mouth pH and therefore cancels out stink in the long run. I can see the plaque / grime come off on the wipe, very satisfying! WHY MINT?? They work but my cat (and I) hate the scent. I use these for my small dog and cat. The sheets are relatively large so I usually cut them in half and use one half for the dog and one for the cat. The wipes are a lot easier to use than a brush but do freshen their breath immediately. The reason for only 4 stars is because I haven't been able to use on my dog as yet. She backs off when I try to clean her teeth. Once I am able to get her used to the wipes, I am sure I will put 5 stars next time. The wipes smell nice and are a decent size.